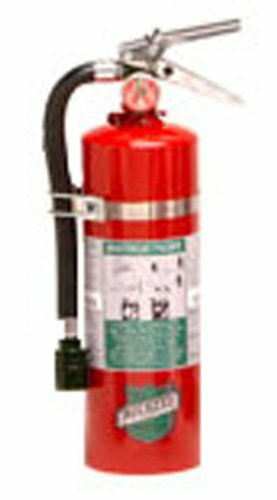 Buckeye halotron is a clean, non conductive gaseous agent that is an excellent replacement for Halon 1211 extinguishers. Halotron is suitable for use on Class A, Class B and Class C fires. Typical uses for protecting sensitive electronic equipment in offices, classrooms, churches, parking garages, and hotel/motel assembly halls and guest areas. For protecting sensitive electronic equipment in businesses such as retail stores, light manufacturing facilities, research facilities, auto dealerships, vehicle/aircraft/marine service centers, and manufacturing processes such as painting, dipping, and coating. Not UL Listed or suitable for use on fires involving cooking oil and grease. Recommended for use on sensitive electronic equipment. The extinguisher nameplate incorporates bilingual operating and maintenance instructions. Industrial grade steel and aluminum cylinders with polyester powder coating designed to withstand harsh environments and rough usage. Available in English/Spanish and English/French. 5.5 lbs agent capacity. 5-B:C UL rating. 9 second discharge time. 9-feet to 15-feet discharge range. 100 psi operating pressure. Vehicle bracket included. USCG approval: Type B:C size I. Dot compliant. Measures 4-1/4-inches diameter by 6-1/2-inches width by 16-3/8-inches height.